Neffs Mill Covered Bride goes by many different names. 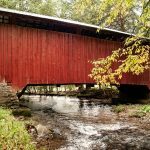 Neffs Mill is the most common but it is also know as Pequea 7 after the creek it spans as well as Bowmans Mill Covered Bridge. 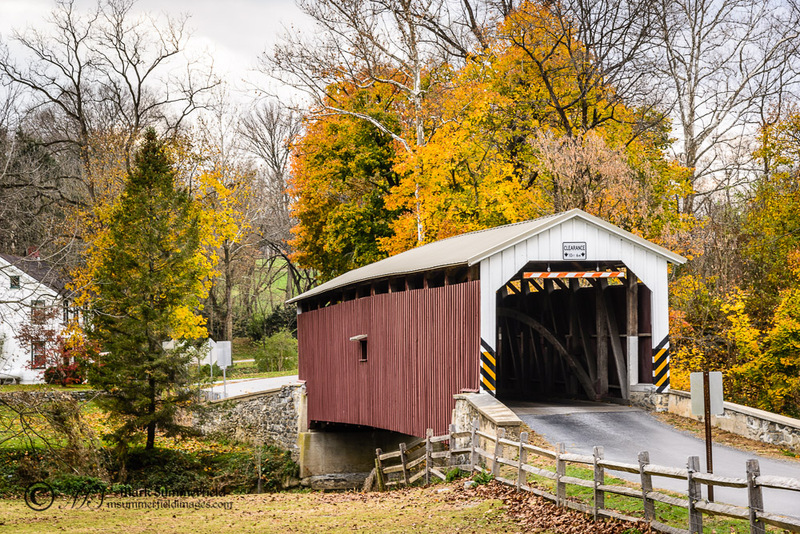 It is situated on the border of West Lampeter Township and Strasburg Township in Lancaster County, Pennsylvania. It was originally built by Christian Brackbill in 1824. 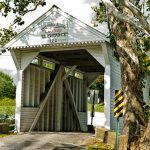 At this time it was known as Bowmans Mill Covered Bridge. It was rebuilt in 1875 by James C. Carpenter. 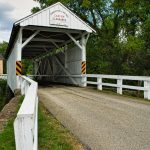 The bridge is of a double Burr arch trusses design with the addition of steel hanger rods. The deck is made from oak planks. It is the narrowest bridge in the county with a clear portal opening of only twelve feet, ten inches. It is 102-feet long and open to traffic. 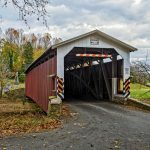 As with all covered bridges in the US, Neffs Mill Covered Bridge is listed on the National Register of Historic Places, being added to the list in December 1980. 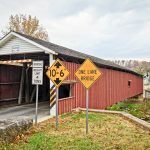 The most comprehensive guide for finding and/or learning about Covered Bridges in this area is Pennsylvania’s Covered Bridges: A Complete Guide by Benjamin D. Evans. It was published quite a few years ago now (but is still available on Amazon) but nothing else even comes close. 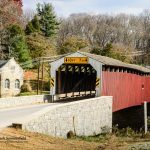 Neffs Mill Covered Bridge goes by many different names. Neffs Mill is the most common but it is also know as Pequea 7 and Bowmans Mill Covered Bridge.